James Albert Clark Bayes, 80, of Waterville, OH, passed away Wednesday, September 14, 2016 at Hospice of Northwest OH, Perrysburg with his loving family at his side. He was born December 15, 1935, in Toledo, OH, to James and Ruth (Menne) Bayes. Jim was in the class of 1953 at Burnham High School, where he proudly served as the drum major. He studied music at the University of Toledo for two years. He had a career in insurance for over sixty years, earning his CPCU while working at several agencies and companies, including Brooks Insurance Agency and Regan Insurance. 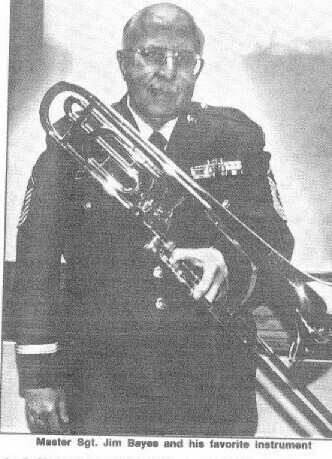 Jim served his country in the Ohio Air National Guard 555th "Triple Nickel" Band for 40 years, retiring with the rank of Senior Master Sergeant. He continued his trombone playing with the Polish American Concert Band for 25 years. Jim was a member of West Toledo Exchange Club, Shriners, and Knights of Pythias. In his younger years, Jim enjoyed raising horses and was an avid bowler. Left to cherish his memory is his loving wife of 42 years, Judy L. Bayes; sons, Michael (Sara), Thomas (Amey) and Jeffrey Bayes; daughters, Melissa (Joe Mason) Niedzwiecki; Janel (Mike) Mowka; Kellie (Randy) Erbskorn; 15 grandchildren and 15 great grandchildren. Friends may call at the Reeb Funeral Home, 5712 N. Main St., Sylvania, OH, Sunday, September 18, from 2 to 8pm. The Funeral Service will be held at Olivet Lutheran Church, 5840 Monroe St, Sylvania, OH, Monday, September 19, at 11am with visitation one hour prior. Interment, with Military Honors, will follow at Ottawa Hills Memorial Park. Those wishing to give a memorial are asked to consider Shriners' Hospital or Olivet Lutheran Church.